On 23 July 2018, the Financial Adviser Standards and Ethics Authority (FASEA) released Consultation Paper 5: Professional Work & Training Requirement (Professional Year). The consultation paper provides guidance on the Professional Year program that is required to be completed by all new entrants to the industry. New entrants are those who register on the Financial Adviser Register post 1 January 2019. The paper also proposes that existing advisers who take more than a two year career break will have to complete “appropriate CPD”. To be clear – if an adviser is currently registered on the ASIC Financial Advisers Register, or will be before 1 January 2019, the only part of this draft standard that applies to them is the CPD proposal when they take a career break of more than two years. Existing advisers who are interested in the CPD proposal for re-entering the industry after a career break should see the CPD section below. What will new entrants be called during their Professional Year? The new entrant is intended to be known as a ‘Provisional Financial Adviser’. They will not be allowed to call themselves a ‘financial adviser’ or ‘financial planner’ until they have meet the Exit Criteria – set out below. Please refer to FASEA Consultation 4: Provisional Relevant Provider Term for more on FASEA’s reasons for preferring this term over others. 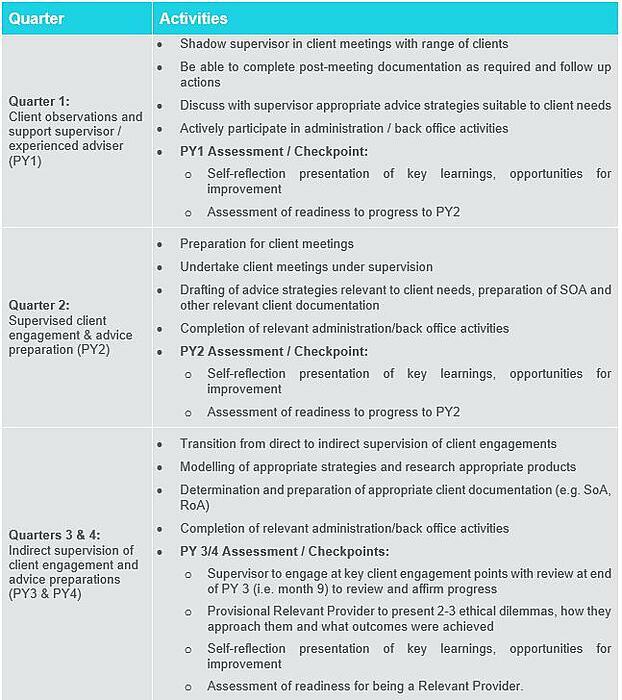 The role of the supervisor is to provide appropriate supervision, including approving in writing any Statement of Advice (SoA) provided to a retail client during the relevant year. The new entrant will be required to be supervised by an adviser registered on the Financial Adviser Register who has a minimum of two years’ experience. New entrants are required to have completed their Bachelors’ degree and passed the financial adviser examination prior to the commencement of their Professional Year. While completing their Professional Year, new entrants will not be required to comply with the continuing professional development (CPD) standard that FASEA will issue guidance on later this year. Supervisor attestation form / report. reviewed that all relevant work and training requirements have been met. This will likely be a part of the ASIC Register form for Licensees to complete in order to change the Provisional Financial Adviser’s register entry. As noted above, the consultation paper also proposes that after 1 January 2019 a financial adviser can only re-enter the industry after taking a career break longer than two years if they “undertake appropriate CPD to ensure they are equipped with the latest regulatory and licensee requirements”. FASEA have not confirmed what “appropriate CPD” will be nor what constitutes a “career break” and unfortunately, FASEA’s proposed CPD Standard does not clarify the issue. At this stage, FASEA is only seeking feedback on whether requiring completion of “appropriate CPD” to re-enter after a career break longer than two years is appropriate for them to issue guidance on. FASEA welcomes feedback and submissions to assist in finalising the development of the Professional Year requirements. Submissions can be directed to consultation@fasea.gov.au by 5pm 17 August 2018. Should you have any queries in relation to the Professional Year requirements please contact education@cpal.com.au or alternatively contact your local Professional Standards Consultant.